Blog / WHEN ARE PHOTOVOLTAIC SYSTEMS THE MOST COST-EFFECTIVE SOLUTION? In the last ten years, the price of photovoltaic energy has fallen by 90% thanks to the reduction in the cost of technology - a phenomenon that is absolutely unique and has never been recorded before in any other industrial sector. This fact, combined with the constant increase in the cost of energy derived from fossil fuels, already puts us in a completely new scenario, which sees Italy exploit its significant amounts of solar radiation through a substantial investment in photovoltaics. Therefore, even without state incentives, photovoltaics are very affordable, especially when it comes to solar energy self-consumption. Where should the photovoltaic system be installed to get the best efficiency? Better on a roof or on a canopy? A photovoltaic system generates between 1000 kWh and 1500 kWh for each kW of installed power, depending on the place of installation, but that's not all. The economic performance of the system will be strongly influenced by good maintenance, which must be carried out regularly, i.e. it is necessary to keep the surfaces of the modules clean and to check their operation regularly. Pollen, particulates, bird droppings and foliage can all have a negative impact on plant performance. Ventilation is also essential: it is necessary to avoid overheating the panels to get the best performance of the system. Apart from routine maintenance, it is advisable for the owner to carry out regular visual checks for damage or dirt. Many companies install photovoltaic systems on the roof of their premises. In this case, maintenance work requires special safety measures to prevent falls, as provided by law, especially on pitched roofs. Among the costs of installation of a system on the roof, it is therefore necessary to account for the provision of "life lines", i.e. anchors for hooking the operators by means of harness and the relative safety lanyards. To sum it up, if the company does not function as it should, the roof system could be harmful, since the fixing of the panel-holding frame to the roofing floor could cause the breakage of tiles or waterproofing layers, creating rainwater infiltrations. The safest type of installation, which makes maintenance operations much easier, thus ensuring optimal operation of the system, is on a carport. Many companies have large car parks that could easily be converted into sources of clean energy. In addition to facilitating the visual inspection, the photovoltaic carports can be cleaned and maintained without any special precautions and the panels get plenty of ventilation. 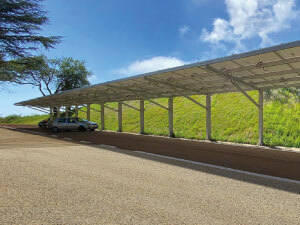 There are different types of photovoltaic carports on the market. The cheapest ones are made of iron profiles, a material that deteriorates very quickly unless frequent anti-rust maintenance operations are carried out. The alternative is the aluminium photovoltaic carport. Aluminium oxide is protective rather than corrosive, so it does not require maintenance. Some companies offer carports on concrete bases, to facilitate installation operations without damaging the ground with foundation excavations. It should be noted that photovoltaic canopies on concrete bases for some municipalities are classified as temporary structures, so it is not even necessary to apply for a building permit. We invite you to consult the technical offices of your local municipality. For companies, the solar energy self-consumption is now the most profitable choice: the peak of production of a photovoltaic system, in fact, coincides with working hours, when the energy on the electricity market has low prices. This means that it is much cheaper to consume the energy produced directly than to feed it into the grid. According to the GSE (an Italian company that manages energy supply and environmental sustainability), 24,377 GWh were produced in Italy in 217, of which 52% was generated by the industrial sector, with a growth of 10.4% compared to 2016. In the industrial sector, the quota of self-consumption has reached 20% of the total photovoltaic production, a number that is bound to grow exponentially. This natural market development will partially help our country to achieve the European targets that require us to reach at least 30% of gross domestic consumption of energy from renewable sources by 2030. Not only the European directives, but the real convenience of photovoltaics, no longer dependent on state incentives, are already contributing, in several European countries, to the creation of a specific and clear regulation that can create the optimal conditions to achieve the high undiscovered potential of the industrial chain of the sector.